Bloodhound breeders links and breed information on pups4sale.com.au. The Bloodhound is an old breed that has been known for its sense of smell for centuries now. They may look a bit goofy, but they are smart, energetic and loving dogs that just about anyone would be happy with as a pet. Many people assume that the name “Bloodhound” was given to the breed because they can smell blood and track it. While it's true that blood is one of the scents that they can pick up, they were actually given their name because the original breeders were very proud of themselves for maintaining a full-blooded breed. Bloodhounds can and do live just about everywhere, which is why they continue to be one of the most popular breeds around today. Pretty much every part of a Bloodhound's body droops, which makes it an easy breed to recognize and mighty cute from when they are puppies through to adulthood. While their droopy features may make them look a bit on the lazy side, in reality those features are actually what make them great sniffers. The droopy eyes keep their attention on the scent and their droopy ears and necks hold scent particles so they don't forget what they're looking for. Male Bloodhounds usually grow to be between 24 and 27 inches tall and can weight anywhere from 80 to 120 pounds. Females are just a little bit shorter and weigh 10 to 20 pounds less than males. Bloodhounds have short, dense coats on top of that distinctive loose skin. 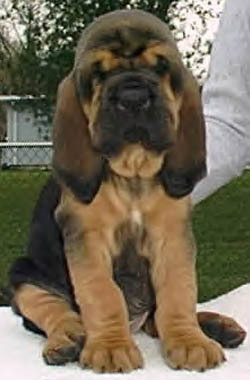 Although most people know Bloodhounds in their black and tan look, they can also be found with red coats or even a liver and tan mixture. 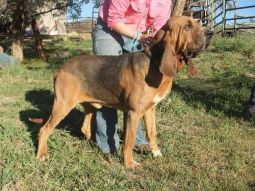 Owners are usually surprised by how active their Bloodhounds are because they simply don't look like that type of breed. The fact is that they love to run around as much as they like to use their noses to smell everything that come in contact with. Bloodhound puppies look a lot different than they do when they become adults, but owners certainly get a feel for what type of dog they are going to end up with. Young Bloodhounds can play for hours and grow quite quickly, which can make them a bit more destructive than other breeds. Bloodhounds are considered to be great family dogs, but parents should always keep an eye on their young children when they are playing with this breed. They will never try to hurt anyone in their families intentionally, but their big size and goofiness can sometimes result in them accidentally bumping into young kids. For the most part, Bloodhounds are great with other dogs and will stay calm even when another dog is jumping all over them. However, there have been some cases where they don't get along with other male dogs initially so owners should get a feel for how their Bloodhounds will act around other animals at a young age. Bloodhounds naturally love all humans, so this means that they just won't be good guard dogs no matter how much training they get. Of course, they are prone to barking and howling at suspicious sounds, so people who want an above average watchdog should be quite satisfied with the Bloodhound. Bloodhounds will chew on just about anything around the house if they don't get the attention that they need, so they are definitely not dogs that should be left at home alone for an extended period of time. A patient trainer will find that Bloodhounds aren't all that hard to train as long as you give them time to figure out what you're trying to tell them. However, people who would like their dogs to learn quickly will find training a Bloodhound to be quite difficult. Once they learn something, they will know it forever, but getting there requires a lot of repetition. That sense of smell that Bloodhounds are so well known for can be a great thing for their owners, but it can also be quite the headache. If they happen to catch a scent and the owners aren't prepared for it, they can sometimes run off or will drag their owners until they run out of energy. This is why it is vital that Bloodhounds are trained so that they know to listen to their owners over listening to their noses. While Bloodhounds do get extensive training when they are hired by police forces, it actually doesn't take too much training for them to learn to follow a scent. Even though they may be tough to train in other areas, owners who want to use their Bloodhounds to help them hunt will find that they are naturals at tracking game. Bloodhounds may look like they would run out of energy quite quickly because of their big size and loose skin, but they can walk and jog for hours. They are happiest when they are outdoors and able to use their noses, so owners simply have to take them on long daily walks. They should always be kept on a leash because they will follow their noses and can get lost before they even notice that their owners aren't there. Bloodhounds like to play fetch almost as much as they like to go on walks, so 15 to 20 minutes should be allotted for these activities each day, as well. Unlike many other breeds, Bloodhounds just don't get bored of going to fetch a toy and bringing it back to their owners. This is why many Bloodhound owners don't feel spending time with their dogs is a chore. Bloodhounds need a bit more grooming than the average breed. This mostly has to do with their loose skin and the fact that they will shed throughout the year. However, most of their additional grooming needs take about 30 minutes per week, so it isn't too much of a hassle for owners to keep up with it. 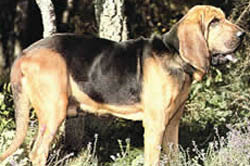 A special Bloodhound brush called a hound mitt should be used to brush this breed. Their skin is thinner than most other breeds, so a gentle brushing with a hound mitt once a week will keep their coats in good shape. Those big floppy ears that Bloodhounds have need to be cleaned at least once a week to prevent any type of infection. If they aren't cleaned regularly with a cleaning solution from the vet, they can develop very bad ear issues that can keep this breed from living a happy, healthy life. The one other special grooming need that Bloodhounds have is under that loose skin that they are so well known for. Twice or three times a week, owners should clean underneath all of those folds to keep them from developing infections. Bloodhounds are relatively healthy dogs for their size. They are prone to many of the diseases that other larger breeds are prone to, but they aren't known for the bone issues that many other large breeds end up having. Bloat is a common health issue with Bloodhounds because of their overall body structure and their size. This disease can be avoided, though, if owners stick to a strict feeding schedule and elevate the dog bowls to help with digestion.Most Bloodhounds live for 10 to 12 years, but those that are kept in great mental and physical shape can live a little bit longer than that. The absolute best fits for this breed are people who have a lot of patience and are willing to let their dogs fail many times before they succeed. These types of owners will be rewarded quicker than people who get frustrated when their pets don't do what they expect them to do. While Bloodhounds don't need a huge house or a big backyard to be happy, owners who have plenty of space for their pets to move around in will find that their Bloodhounds won't get frustrated very easily. Of course, if a Bloodhound gets enough time to play around outside, the size of the house and the yard doesn't matter very much. The worst fit for a Bloodhound is anyone who doesn't have the time to spend with their pets. Bloodhounds require a lot of attention, so people who have to spend most of their days at work and just don't have the time or energy to spend training and just hanging out with a Bloodhound should look into getting another breed. Bloodhounds do have special needs when it comes to training, so people who don't learn how to train these types of dogs will probably find that this is not the pet for them. It is okay for Bloodhounds to be trained by a professional, but the owners have to be there so they can continue the training at home. Otherwise, the dog may do more harm than good around the house. Bloodhounds may be known for their amazing sense of smell, but those who have gotten to know these dogs know that this is just a great all-around breed.